Mushin Budo Ju Jitsu Martial Arts London and S.E. Mushin Budo Ju Jitsu (unarmed combat) is an ideal martial art for both men and women, boys and girls. Benefits include improved fitness and co-ordination, effective defence techniques, personal awareness, increased self-confidence, "hardening the target" for both adults and children. Techniques you will encounter in Mushin Budo Ju Jitsu include kicks, punches, throws, takedowns, locks, strangles, pressure points, submissions, defences against weapons and escapes. You will also learn how to to be thrown safely. The syllabus is modified for children and does not include joint locks, strangles or submissions for under 16s. News of a tragic nature. Soke Andy McGill was until the early hours of Saturday morning 28 July 2018 living on his boat, The Lady Eve, in Ramsgate Harbour. There was a fire that destroyed absolutely everything he owned, and he escaped in just the clothes he was wearing, aided by some off-duty paramedics who bravely went to his aid. His boat and all he owned is at the bottom of Ramsgate Marina. He is in pretty good spirits, considering. His daughter has started a GoFundMe page and any donations that would help him start to get his life back together while the fire investigation and insurance claims get under way would be hugely appreciated. His inner strength and resilience has been severely tested. Thank you in advance. Our Data Protection Policy is available. By completing a membership form you confirm we may use your data in the ways we tell you about. Mushin Budo Ju Jitsu Club instructors are experienced in many martial arts, including wrestling, eskrima, kenpo, not just Ju Jitsu, have Professional Indemnity insurance and those teaching children have undergone background checks. 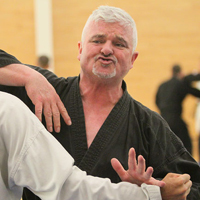 Mu-Shin is something to strive for in your martial arts training. It is not easily attained. Once mastered, it can be applied in all aspects of living, to great advantage.